Whether you choose breast implants filled with silicone gel or saline (salt water), the specific type of outer shell for your breast implants seems to be a rarely discussed topic. Many patients do not even realize that they have a choice when it comes to breast implant outer shells. 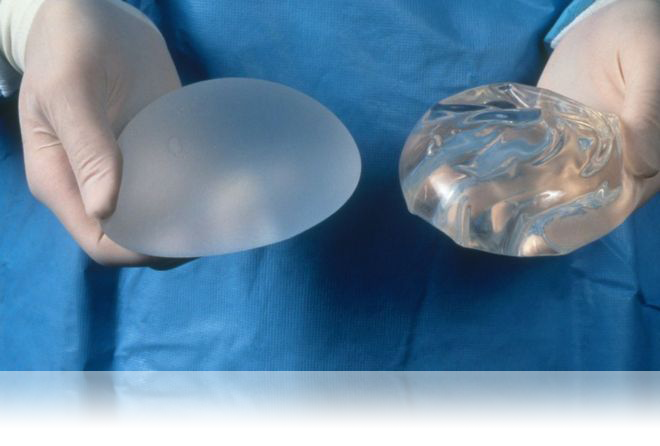 Even some plastic surgeons do not truly understand the structure of breast implants shells. After all, if you choose to have breast augmentation, it is the outer shell that actually holds the inner filler material. It is the outer shell that will be in contact with your tissues from day one of your breast augmentation. I am occasionally asked by my breast augmentation patients “Dr. Hayduke, what is the outer shell of a breast implant made of ?”. Extensive chemical cross-linking of silicone gel (polymer) produces a solid form of silicone referred to as an elastomer. An elastomer is a rubber-like material composed of long chain like molecules that is capable of recovering their original shape after being stretched.All breast implant shells used in the United States are made of a synthetic silicone elastomer with a flexible, rubber-like quality. The outer shells of breast implants (both for silicone and saline-filled implants) are made of the same silicone elastomer. During your in-office consultation with your plastic surgeon, feeling both silicone and saline implants with multiple shell surfaces should certainly be part of your decision-making process. The part of the implant that you actually touch is the outer breast implant shell. You will notice that the outer shells of breast implants have a very soft, rubbery feel. Silicone elastomers are also used for the manufacture of other implantable medical devices as well, such as facial implants and tissue expanders. In general, breast implant outer shells are classified as either TEXTURED or SMOOTH. TEXTURED breast implant shells have a slightly bumpy/porous feel to them and a white colored appearance. SMOOTH breast implant shells are totally free of bumps and feel silky smooth like a balloon’s outer surface. Smooth surfaced implants are totally transparent (no color). Shell characteristics also depend upon the thickness of each shell and how the internal silicone gel is bonded to the shell (in the case of silicone gel filled implants). The three main FDA approved breast implant manufacturers in the United States are Mentor, Allergan (formerly McGhan-Inamed), and Sientra. In the 1980s, breast implant manufacturers shifted their focus from foam covered shells to textured silicone shells with different pore sizes. None of the textured surfaces were created in the same manner and each manufacturer had a proprietary process in place. One of the goals of the breast shell texture was to find a way to stabilize the implant in the breast pocket.Implant manufacturers were trying to keep the breast implants from moving or shifting after they were inserted by the surgeon. This was most relevant for shaped “teardrop/anatomic” type implants since even a small shift in position of a teardrop/anatomic shaped breast implant after insertion may result is an obviously visible problem. Studies demonstrated that the texture pore size was critical to allow for tissue adherence leading to the “adhesive effect” and breast implant stabilization. Slight shifts of round breast implants, however, usually do not cause a significant visual problem. For this reason, texturization of round breast implants is not as important (since the breast implant is round and not teardrop in shape). Smooth surface implants are made by dipping a mandrel into liquid silicone creating multi layers, followed by allowing the surface to cure in a laminar flow oven. The steps involved in the manufacturing process of textured implant is far more complex. Sientra’s Silimed implant (Sientra, Inc. Santa Barbara, USA), named as TRUE Texture avoids the use of sodium chloride, sugar, soak/scrub, or pressure stamping to create texturing. Small hollow pores are formed with minimal thin cell webbing that reduces particle formation. The BioCell (Allergan, Inc. Irvine, USA) texture is created using a “loss-salt” technique, which includes a layer of salt crystals with a thin overcoat of silicone followed by curing in a laminar flow oven. The Siltex surface (Mentor Corp., Santa Barbara, USA) on the other hand, is created by “imprint stamping”, which dips the chuck into uncured silicone, pushing it into polyurethane foam and finalizing the imprint with pressure. ALCL (Anaplastic Large Cell Lymphoma) is a rare type of lymphoma that seems to be somehow associated with TEXTURED outer shell surfaces of breast implants. More data is being collected currently on this rare lymphoma (it is not breast cancer). I have always personally favored the feel of smooth breast implant shells over textured breast implant shells. Discussion of the types of implant shells, pros and cons, and long-term consequences of breast implant shell choice should certainly be part of a comprehensive breast augmentation consultation with your board certified plastic surgeon. Whether you are getting your breast implants in Palm Desert, Palm Springs, Rancho Mirage or Beverly Hills California, please come to your first consultation armed with some basic knowledge. Most importantly, patients must understand that they have a choice when it comes to outer breast implant shells.